Limon, with its Afro-Caribbean culture, offers the visitor a different environment that you can find in the rest of the country, with its flavor of reggae, calypso and soca. Some say the name comes from the lemon tree that is abundant in the area, others say it is due to the arrival of Spain’s Miguel Limon. It is the busiest port in the country and is located on the Caribbean coast of Costa Rica. The city of Limon is geologically formed by materials of Tertiary and Quaternary periods. The city is an important Guápiles commercial and banking center and home to many schools and colleges as well as a university and institutions of public and private higher education. The territory of Pococí is mostly flat. Main products are bananas, grains, and livestock. There are areas of great scenic beauty, like the pipes of Tortuguero and Barra del Colorado, where tourism is a great source of wealth. Siquirres is the third canton in the province of Limon in Costa Rica and was created by the Act No. 11 of the September 19, 1911. It is the epicenter of the province of Limon and thelands are low. The average temperature around 29 °C. It is a mainly agricultural canton and its most important activity is the production of banana and pineapple. It is connected by road with the rest of the province and the country. Talamanca is the number four canton of the province of Limon and the largest of the six cantons of the province of Limon , Costa Rica . It is the second largest area in the country. Its area of 2809.93 km ² is even higher than the province of Heredia. Talamanca is one of the counties that have a higher biodiversity and its climate ranges from the humid tropics of the coast through the rainforest to the glacial cold moors of the Cordillera de Talamanca, the highest and most extensive of Costa Rica, with mountains that reach 3802 meters above sea level. Its beaches are among the most beautiful in Costa Rica, including: Cahuita National Park, with a coral reef unique in Costa Rica, Puerto Vargas, Puerto Viejo, Manzanillo and Gandoca biological reserve, Punta Mona, Cocles, Playa Negra, or Black Beach etc. The area is drained by the rivers Matina, Moín and Madre de Dios. Chief products are bananas, cacao, plantain, pejibaye and beef cattle. The canton includes the Caribbean coast between the mouths of the Río Pacuare to the north and the Río Toro to the south. In pre-Columbian times the territory that now the canton of Matina was inhabited by indigenous group called the Pococí. 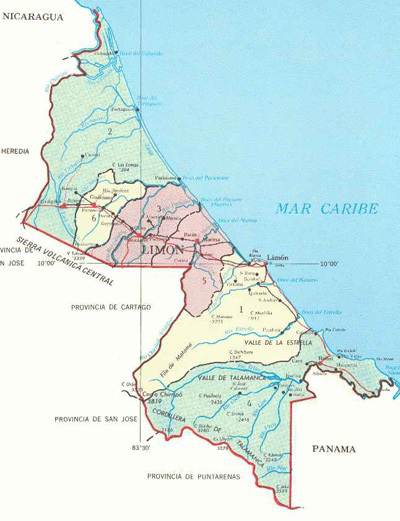 The name of the sixth canton in the province of Limón is Guácimo. Guácimo is the capital city of the canton. There is only one canton that does not touch the Caribbean Sea and the canton is Guácimo. Guácimo is the newest canton in the province of Limon. Bananas , cassava , corn and pineapple are the main products of the canton.